U2 is an Irish rock band. The four members of the band are lead singer Bono (born Paul David Hewson), lead guitarist The Edge (born David Howell Evans), bassist Adam Clayton, and drummer Larry Mullen Jr. U2 are a very popular band all over the world and have been since the 1980s. They have sold more than 170 million albums and have won 22 Grammy Awards. This is more than any other rock band. U2 was formed in the city of Dublin, Ireland on September 25, 1976. It was founded by 14 year-old drummer Larry Mullen Jr. He posted a note on his school's notice board, asking for musicians to create a new band. There were seven teenage boys who went to their first practice. At first, the band was called "The Larry Mullen Band", but they later changed their name to "Feedback" and then "The Hype". 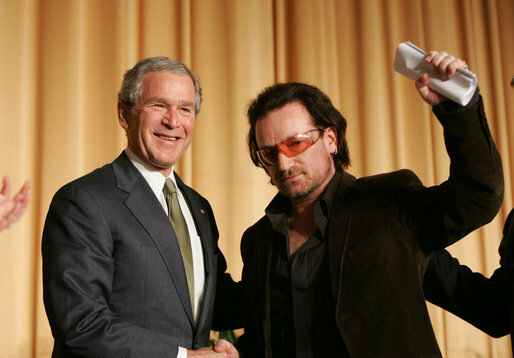 The band became smaller over time, eventually becoming just four people, and they finally changed their name to "U2" once Bono, The Edge, Clayton, and Mullen were left. The band formed at Mount Temple Comprehensive School in Dublin in 1976 when the members were teenagers. The tree pictured on The Joshua Tree album sleeve. Adam Clayton said, "The desert was immensely inspirational to us as a mental image for this record." Bono in March 1992 on the Zoo TV Tour portraying his persona "The Fly", a leather-clad egomaniac meant to parody rock stardom. Contrasting with the elaborate stadium productions of the band's previous two tours, the Elevation Tour was a scaled-down affair, featuring a heart-shaped ramp around the stage. The outdoor stage of the Vertigo Tour, pictured in June 2005, featured a massive LED screen. 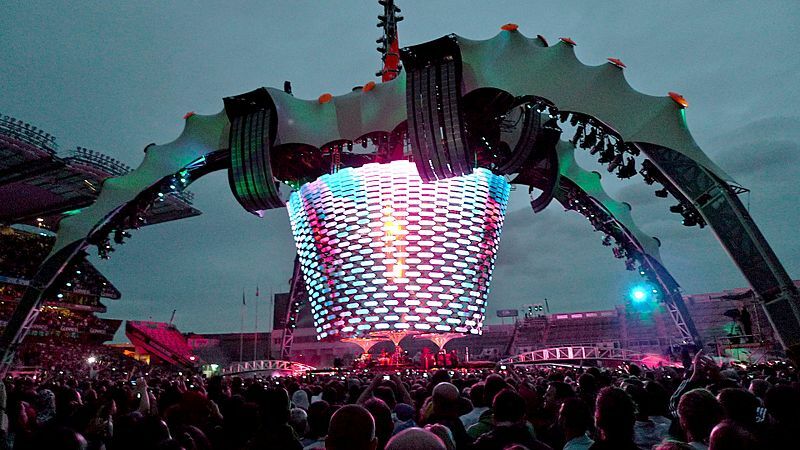 At 164 feet tall, the stage structure from the U2 360° Tour was the largest ever constructed. It allowed for a 360-degree seating configuration. U2 performing in 2009. The Edge has described U2 as a fundamentally live band. U2 (band) Facts for Kids. Kiddle Encyclopedia.